The time has come to move further in our Automation series, now that we’re pretty much done with the “physical” provisioning part using Razor. One of the first things I’d like to share with you is how to get lighttpd up and running on a newly provisioned server, and make the deployment process fully automated using Puppet from Puppetlabs. Creating something that automates something else is not an automated process in itself (Quantum computing and smart AI might change that around year 2030). So while the configuration below might look complex to do a simple task, remember that you can reuse the same configuration for many nodes. One configuration for Many installations instead of Many installations with Many (often different) configurations. I am using the free and open source verion of Puppet, which means we do not have a dashboard for even easier configuration. Might do a post about that later on. Now that that’s out of the way, let’s get started! For this exercise, we’ll install the lighttpd webserver (awesome httpd alternative to the bulky Apache IMHO) onto one of our newly provisioned nodes. As Razor during OS-provisioning will be giving the node a specific node name which will then be used in the handoff to the puppetmaster, this is the name we’ll be using throughout the tutorial. If you have a smaller test environment, or not using Razor at all, you could also give it a more userfriendly name, say “webserver01”, by just editing the puppet.conf file on the node itself. 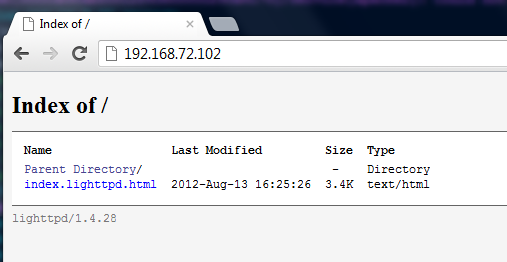 It has a “fancy” node ID called “35553b90abfc012f4380000c293a4170” . Remember that until a bit later. 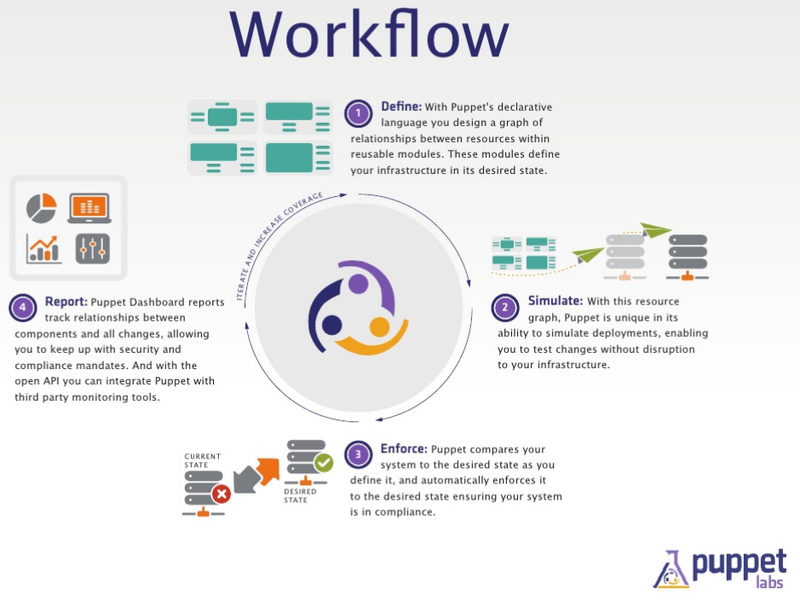 When creating an automatic configuration for a puppet node, we need to go through a few stages. First of all, stop the puppet agent service on your node, as we’ll run puppet agent manually. Now, there are 4 steps that should always be taken when creating a configuration; Define, Simulate, Enforce and Report. Let’s go through that config, bit by bit. “Package” means we’ll handle an installation package. This usually has a function such as installing a service (like a web server or SQL server) or some functionality (PHP for instance) or a software (like zsh, an alternative to bash). Here we “ensure” that the package “lighttpd” is installed. “Service” means we’ll make sure we have a service tied to this configuration. We ensure the service is running, we’re enabling it on boot, and for this service to function we require the “Package” that we’ve defined. Pretty easy to read and follow, right? It is, HOORAY! How cool is that? And we can now verify that the package is removed, the service isn’t running, and no config files are left. Revert back your changes so that the package IS installed and the service IS running. Let’s continue. For now I just want to show you one easy way of getting the important information into your puppetmaster’s logs instead of having to go through each agent’s logs. The puppet agent send “facts” about itself to the puppetmaster, the puppetmaster answers with the “catalog” which is a compiled list of all aggregated configuration changes that should be done, the puppet agent reports back to the puppetmaster and we can see that report by looking into the syslog file. This entry was posted in Automation, Installation, IT Transformation, Puppet. Bookmark the permalink.